Nic Saintey muses on a carpet which isn't magic, but is certainly unusual. It is said that 'art' is human experience expressed through a creative medium (whether it be painting, sculpture, music or poetry), which for many probably sounds quite pompous. However, the household objects we chose to have around us will all have been subject to creative input and, by default, will reflect our personal and communal experiences. 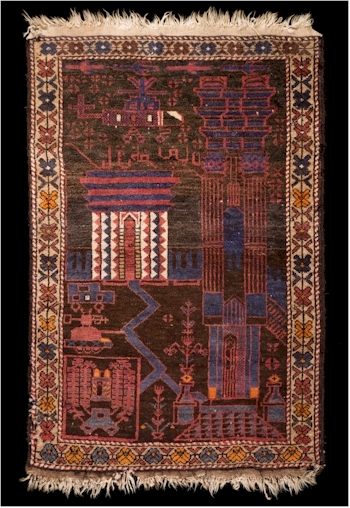 Perhaps antique rugs are a good reflection of this, being both practical and subject to very deliberate design. This, when coupled with the type of wool (or silk) and the range of vegetable dyes to hand, often produces a geographically recognisable style that echoes the environment in which it was produced. When faced with an Isfahan rug, there is no mistaking the depiction of an idyllic garden landscape in which every centimetre is occupied by identifiable flora and fauna. 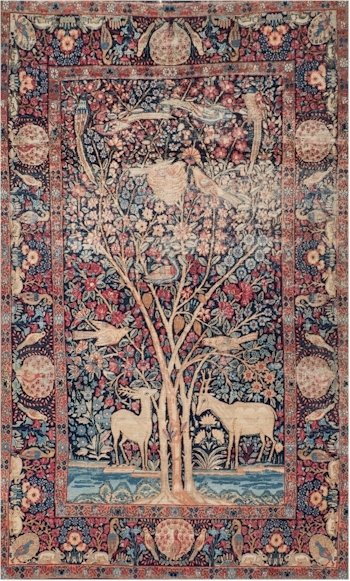 Obviously, a high status rug that depicts 'pet' peacocks which were not indigenous to Iran. 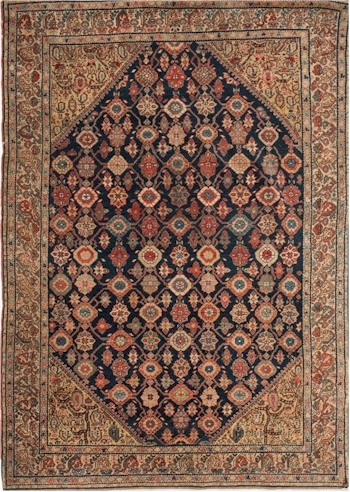 When looking at a Feraghan rug, also from Iran, the decoration is not as sumptuous although the sentiment remains the same, albeit in a more stylised and formulaic manner. Equally as busy, it is also covered with flowers and foliage, though none you might be able to identify. However, I am sure you'll agree the results are still pleasing and probably infinitely more affordable. 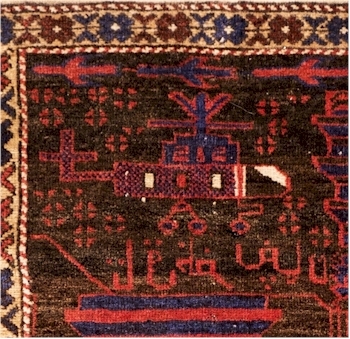 However, from time-to-time, one does come across a rug that seems to contain the unexpected such as the Afghan rug illustrated below. At a cursory glance, it has a border of stylised blooms and two buildings including a large tower, but give it a second look and what do we see in the upper left corner? Although it would appear incongruous, there is a military helicopter beneath a row of bombers, a strange addition until one realises that it was produced during the Soviet occupation of Afghanistan. Once this is accepted, the placing of a tank and an armoured car elsewhere in the scheme is not at all out of place and, if you happened to be a member of the Mujahedeen, this splendid rug might be just the ticket. 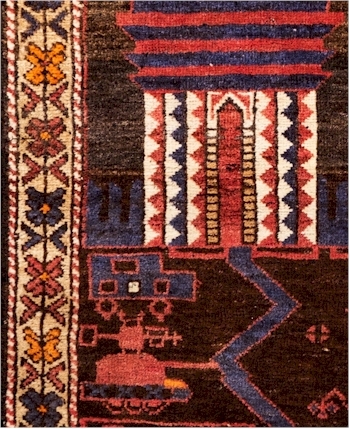 An Afghan Soviet Occupation Rug. Now I grant you that this Afghan Soviet occupation rug may not be a stunning piece of work and the decoration may seem ill conceived and, as rare as they are, these rugs don't achieve high prices. However, one must remember it was not produced for our consumption, but for an Afghan market where it would have had more relevance. As a piece of social history, it certainly resonates with me and I would suggest it has a cultural significance that brings a whole new meaning to the term carpet bombing. Detail of an armoured car and tank. Detail of a Russian military helicopter. Carpet Bombing was written on Monday, 14th January 2019.